Cavaletti Rails– These are rails or poles spaced apart on the ground that the patient is encouraged to walk through. These can help enhance balance and improve weight bearing on previously injured limbs. The height of the rails can be adjusted to provide different effects on different joints. Balance discs– These are inflatable discs that are used to provide an unstable surface to allow for balance training. The can also play a big role in muscle strengthening. Sit to Stand exercises– The focus of this exercise is to practice sitting and standing correctly to help strengthen muscles in the hips and stifle (knee) joints. This is a great exercise to use for a majority of patients and can be performed without the need for expensive equipment. Stair climbing– This can help improve strength and power in the hind limbs. While not ideal for patients immediately post surgery, it is definitely something that can be started once the patient is using the limb more consistently. 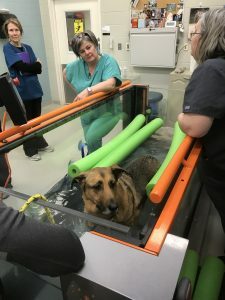 Treadmill– Treadmills can be used to encourage early use of a limb post surgery or injury and are ideal because the speed and incline can be varied. These can be very useful when re-teaching normal gait sequence (gait pattern training) or as part of a weight loss management plan. My head is swimming with all of the information that I have acquired during the lab portion of training. For the final 2 days of the training, the focus will be putting it all together and coming up with a plan to start to implement a rehab training program specific to the needs of our patients. 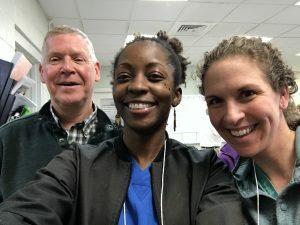 I can’t wait to get back to the clinic and start practicing some of these techniques and observing the ways in which my patients (and their owners) can benefit. See you around the clinic! 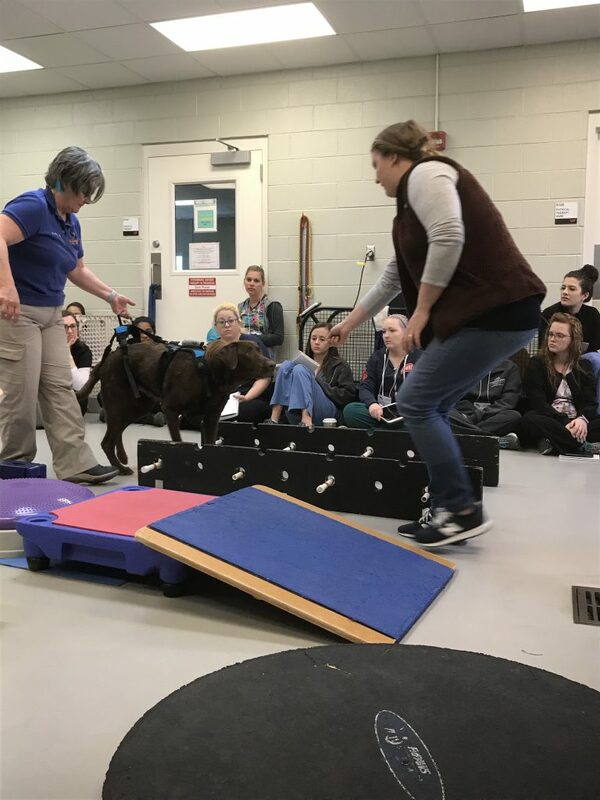 On the second day of our canine rehab training we were able to delve a little more in depth into some of the modalities used in rehab. While we do have laser therapy at Allandale, many of these other treatment options were unfamiliar to me prior to the training. Therapeutic ultrasound– This is the use of sound energy to affect biological tissues. Therapeutic ultrasound can be used to reduce discomfort at trigger points, help with muscle soreness following overuse injury, and reduce pain associated with osteoarthritis. It has also been shown to be beneficial with tissue healing. Shock wave therapy– This involves using high energy focused sound waves to affect various biological responses at the cellular level. It has been shown to speed healing and increase quality of healing of soft tissues and bone. Like many of the other modalities, it also has pain relieving properties. It is used frequently in rehab for osteoarthritis and tendon injuries as well as chronic wound healing. Neuromuscular Electrical stimulation– This is a form of electrical stimulation that causes a muscle contraction to help with muscle weakness associated with a variety of neurologic and orthopedic conditions. NMES can also reduce pain. The key with rehab seems to be learning as much about your patient and their needs as possible, then taking that information and coming up with the best possible plan to help them reach their goals. I’m excited to learn more about ways to improve the quality of life of my patients! Greetings from Knoxville, TN! 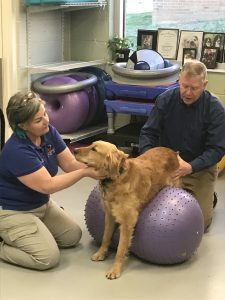 I am here for the next week starting my training to become certified in canine rehab at the University of Tennessee College of Veterinary Medicine. I’m super excited to learn more about this rapidly growing area of veterinary medicine. 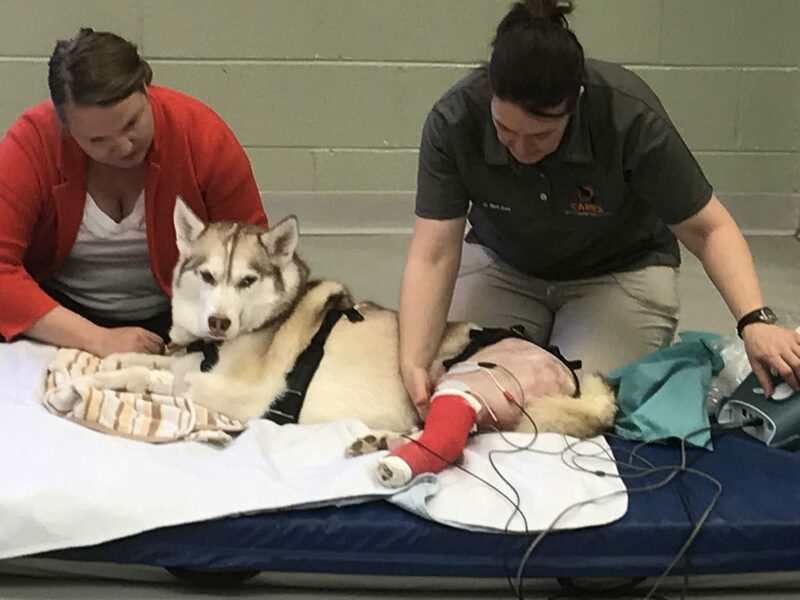 While physical therapy in humans is common, there has been more attention focused on rehabilitation of small animal patients in recent years. Some of you may have met the wonderful Dr. Lobos who used to do rehab at the clinic. 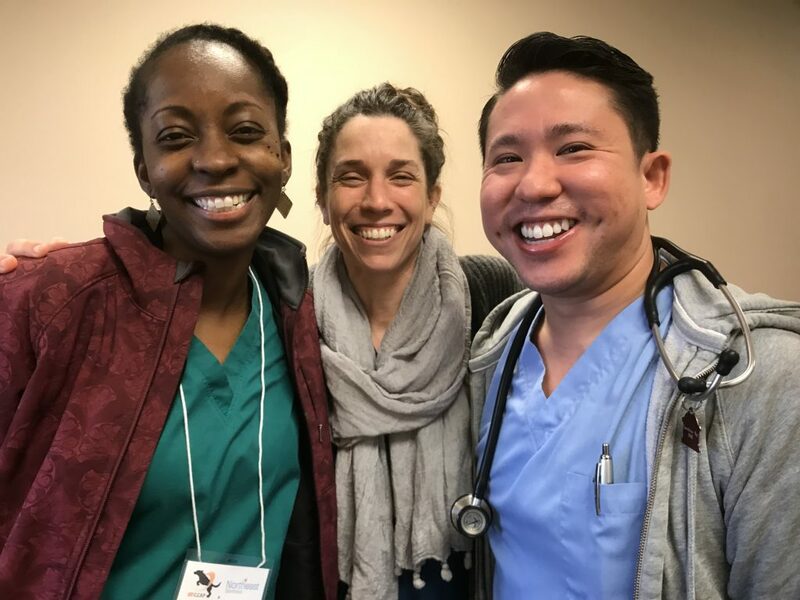 Sadly for us and our patients, Dr. Lobos moved to Colorado this past summer. I started to think a lot more about how beneficial rehab was for so many of our patients and began to explore getting certified. 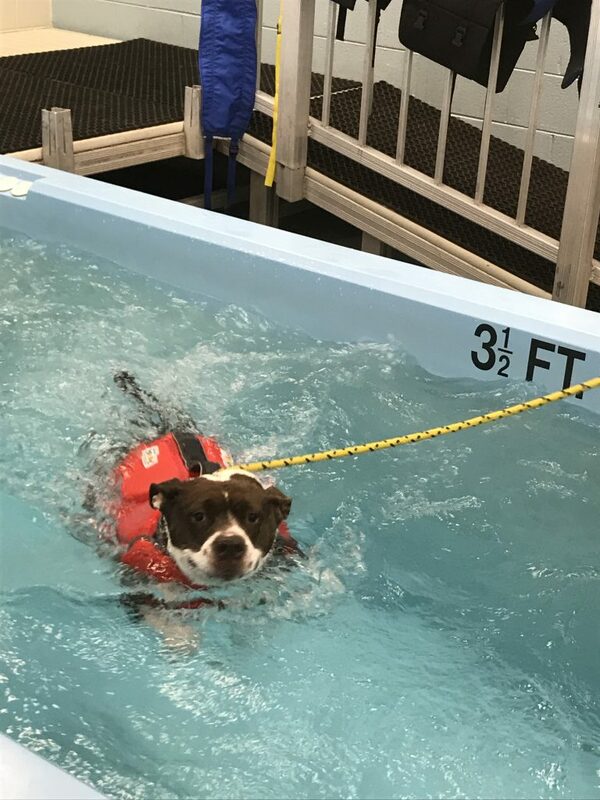 Some benefits of rehab in our canine patients include: increased strength and endurance, reduced pain, increased speed of recovery post surgery, and improved quality of movement. Rehab can be a nice way to complement traditional pharmacological management of chronic conditions. It can also be used as an alternative for our patients who cannot tolerate traditional drugs used for pain management and arthritis. There are so many modalities and exercises to learn about- all aimed at creating the perfect individualized plan for our pets. Looking forward to sharing what I learn with you all, so stay tuned! Thank you for choosing Allandale Veterinary Clinic. We sincerely look forward to meeting you and your pets. Call us today to schedule an appointment or if you have any questions about our practice. Monday — Friday 7:30 a.m. – 6 p.m. Copyright ©Allandale Veterinary Clinic 2019. All rights reserved. Veterinary Website Design by Beyond Indigo Pets.